Tiles can make a room look stunning but over time these tile grout can become dirty which dulls down the appearance of your tiles and makes them look a little tired. Cleaning your grout can make your tiles look clean and fresh and you’ll be amazed at the difference. Grout lines refer to the space between the tiles. Because grout is a porous material it attracts dirt and dust, so even if you clean your tiles on a regular basis, getting deep into those grout lines can be a real challenge. Cleaning floor grout yourself is time-consuming and can take hours spent kneeling on the floor which can make your back ache, as well as hurting your knees and hands. With so many tile grout cleaners on the market, it’s also tricky knowing which one to use, because this can vary depending on what your tiles are made from. Some of these commercial cleaners also contain acid, which isn’t good for the tiles or your health. Now you might be thinking that these challenges give you few options for cleaning your floor tiles, but that really isn’t the case. We’ve put together 3 of the best ways to clean floor tile grout. It’s well documented that white vinegar is an excellent cleaner for the home and can be used on anything – including grout. Simply take some baking soda and mix it to a smooth paste with a mixture of half white vinegar and half water. Using an old toothbrush apply the mixture to the grout lines and gently scrub to lift away any dirt and grime. Once this has been done, rinse the entire area with clean cold water. This method of tile grout cleaning is safe for you and for your tiles. position the steam cleaner with the brush facing the tile grout and move it along each of the grout lines to clean them. Finish by using a clean cloth to remove any dust and residual water. Both of the above methods can be time-consuming and back-breaking and we’re sure you can find better things to do with your time. Our professional tile cleaners can carry out the job in far less time than you ever could using specialised cleaning solutions, equipment, and tools. 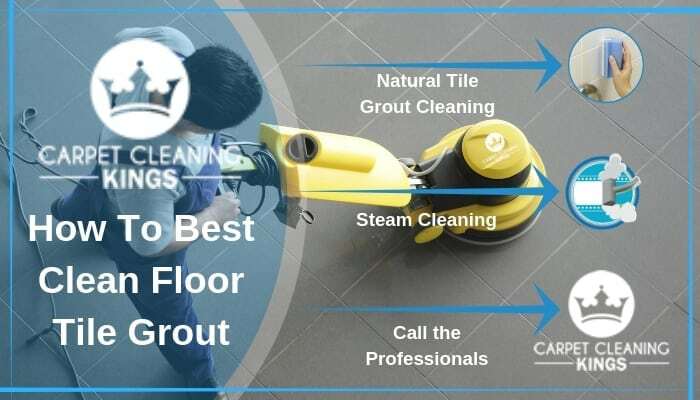 Highly trained, they’ll identify the material used for your tiles and be able to select the appropriate cleaning solutions and method to clean your tiles and grout without doing damage. Your floor will sparkle and shine just like new. If you simply don’t have the time or energy to clean your tile grout, then why not take advantage of our professional tile and grout cleaning service? You can relax and do things you enjoy why our professionals work their magic. Interested? Give Carpet Cleaning Kings a call today on 1300 7000 75.